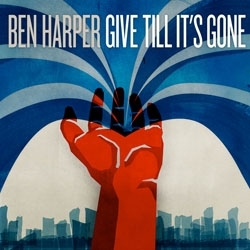 Arts reporter, Ian Birnam reviews Ben Harper's new album, "Give Till It's Gone." As the open-ended summer adventures begin - the kind involving late-night road-trips and crackling campfires � Ben Harper's Give Till It's Gone provides a crisp soundtrack for those sunset shenanigans. His first solo album in five years, Give Till It's Gone continues Harper's harmonious blend of funk lines, flowing jam-rock and soulful ballads with a fresh splash of overdrive thrown in that makes each track go down smoothly. With members of Relentless7 as part of his backing band, Harper gives this album a more bluesy vibe, as the electric six-string plays a more dominant role here than in his past solo efforts. Fans will be happy to hear that the elements of a Harper album are still in place. His ballads and chord progressions can be found throughout the album as Harper's vocals interweave through each track from raging screams to intimate falsettos. Harper's varying vocal range brings to life the emotions that run thick throughout the album. Tracks such as "I Will Not Be Broken" exude raw feelings through fervid guitar strums. On the other end of the spectrum, "Rock N' Roll Is Free" shows an unfettered Harper wailing on his guitar, barraging listeners with screeching solos as his band locks in the rhythm on Harper's usual genre-mixing course. Whether it's his recent marital problems, his time spent with Relentless7 or something else entirely, Harper has brought an edginess to his latest solo album that refuses to go down quietly. Give Till It's Gone showcases Harper's heavier sound as a welcoming addition to his melodious grooves. The distortion is a slight departure from Harper's regular solo material, but it's one that complements his traditional style with a fresh, punchy attitude.